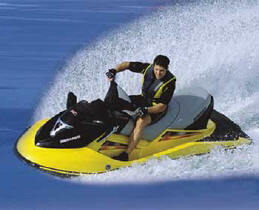 Lake Powell WaterWorld "The Best of All Worlds"
We rent only the best in personal watercraft! Sea-Doo is number one in the personal watercraft market! Try one of our rental units and you'll know why! Our rental units are serviced regularly! We are a reputable established business! We also offer a variety of other services including the mangagment of luxurious shared ownership houseboats. See list of services below. Sales: New and Pre-owned Boat, Personal Watercraft, ATV Sales, Parts, Accessories and Water Sports Equipment Sales. Rentals: SeaDoo Personal Watercraft, Boats, Kayaks, Water Trampolines, Water Sports Equipment - Water Skis, Wake Boards, Knee Boards, Tubes, etc.